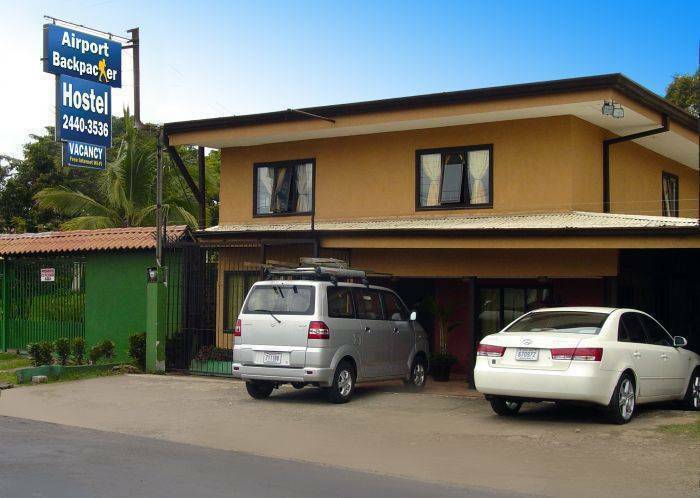 Airport Hotel in Costa Rica half mile east (5 minutes) from Juan Santamaria International Airport (San Jose Airport), on the road to Heredia, Rio Segundo Alajuela. Other options are the main cities located nearby Hotel Rio Segundo. 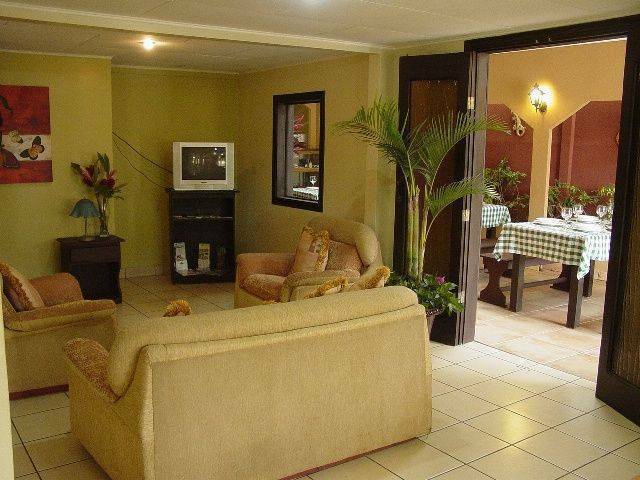 Alajuela is located no more that 5 kilometers away, San Jose 35 minutes by car and Heredia is 25 minutes fromthese areas you will find museums, amusement sites and differents activities for fun. There are Restaurants & Bars, Car Rental, Shopping mall, taxi cabs and bus stops in walking distance from the hotel. We offer the lowest rates in the district of Rio Segundo, Alajuela. 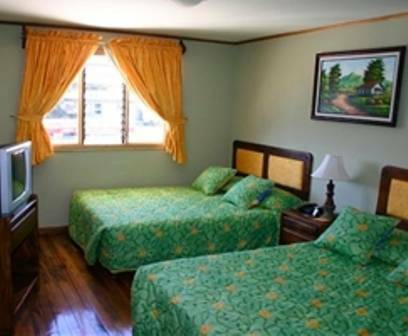 Our charming rooms are eqquiped with wooden floors, Comfortable beds, and private bathroom with hot water, Also Cable Tv (Flat Screen Television), fan and outdoor windows. Our rates include, sale taxes, American breakfast or tipical breakfast from 7:00 am to 9:00am, free Wi-fi access and 10 minutes of international calls to USA, Canada & Puerto Rico. At Airport Hotel Rio Segundo, you will enjoy of a yummy pizza in our restaurant Pizzeria Italiana, where we offer a wide variety menu of Italian pizza. If you want to start your adventure in Costa Rica here is the right place, We're located half mile east from Juan Santamaria International Airport (San Jose Airport). Airport Hotel Rio Segundo has been designed to provide a familiar enviroment, with a friendly staff and good service, for all of those travelers who look for a hotel near the airport and require necessary amenities. Our location makes you easier to reach the airport on time for an early departure or if you're arriving late to Costa Rica. If you want to enjoy the beauty of Costa Rica, in your first day in the country; there are sites such as: Poas Volcano National Park, Sarchi town, known because its colorful ox carts and artcraft, also you can visit Beaches as Jaco and Puntarenas, all of this places are located no more than an hour from Hotel Rio Segundo. Private Room: Breakfast. 1 Double Bed, Private Bathroom with hot water Wi-Fi access, Cable TV, Ceiling Fan, outdoor view window. Free 10 minutes intl calls to U. S, Canada or Puerto Rico. $40 U. S dollars, taxes included. Shared Dorms. breakfast for shared dorms is not included, get it for only $ 5 dollars per person. 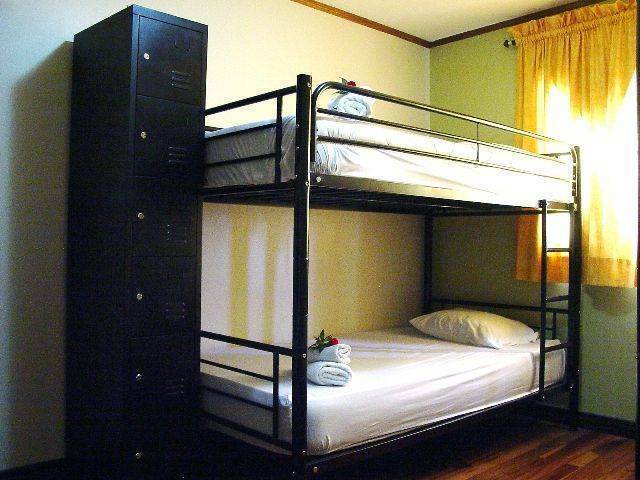 2 Beds/ 3 Bunks, 2 Beds/ 1 Bunk, Shared Bathrooms with hot water. $ 20 dollars taxes included Wi-Fi access, Ceiling Fan, Towel Rents $ 3 Locker Rents $ 3 Free 10 minutes intl calls to U. S, Canada or Puerto Rico. Double Room(2 pax) Breakfast. 2 double beds. Private bathroom with hot water, Cable TV, Wi-Fi access, Ceiling Fan and outdoor view window. Free 10 minutes intl calls to U. S, Canada or Puerto Rico. $ 70 U. S dollars taxes included. Quadruple Room(4 pax) Breakfast. 2 doubles size beds. Private bathroom with hot water, Cable TV, Wi-Fi access, Ceiling Fan and outdoor view window. Free 10 minutes intl calls to U. S, Canada or Puerto Rico $ 90 U. S dollars taxes included. We are located near most of Rent a Car allowing you to reach easily. 800 meters from the hotel. There are bars and restaurants that some of them are popularly called: Sodas. 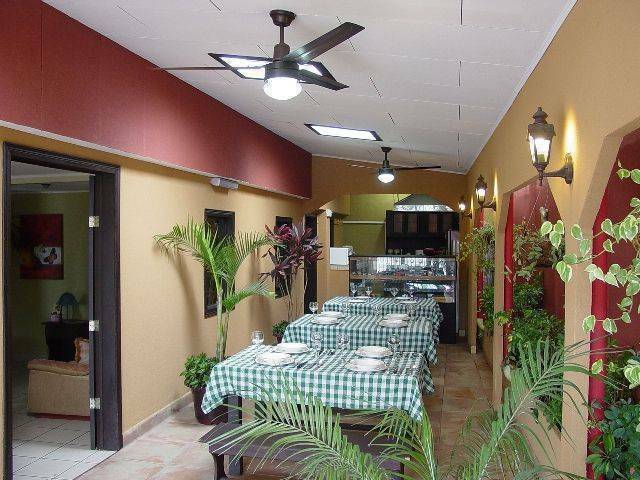 Are nearby, offering good food and drinks to enjoy without having to go far. Denny’s Restaurant. American Fast Food. Rostipollos. All food with chicken. Punto Del Sabor. Pizza Restaurant. La Casona de los Mariscos. Sea food. Located less than 1 km from the hotel. They offer great gifts and souvenirs to share with your loved ones when you return to your country. Three of the most popular shopping centers the central region is located near our hotel. Paseo de las Flores, shopping Center. 25 minutes from our hotel by bus. Zoo Ave-Which is a zoo, an Ambitious Environmental Education program, and an unique animal rescue project Zoo Ave, is Located 15 km North West from here is a short bus ride from Alajuela. You Can take a bus goes Toward Athens Then you have let the bus driver knows where you want to go he’ll notify you when you have to get off by Zoo Ave. This bus will cost you about $ . 50. PANACA Agricultural Park is the first large format domestic animals zoology in Costa Rica and it’s located in San Mateo de Alajuela just 1 hour from here. Located about 30 km. northwest of the city of Alajuela, the town of Sarchi is probably more known for his colorful and decorative ox carts that are made here for centuries. Adjacent to Greece a few kilometers away is the small town of Sarchi, known throughout Costa Rica for its beauty, its complex art, crafts and souvenirs. It can be visited if you go to Poas Volcano National Park or the charming natural reserve called Juan Castro, as both are only an hour away. There is accessibility to the most central cities of Costa Rica by public transportation, (Alajuela, Heredia and San Jose) from Rio Segundo Alajuela. Heredia City is located at 30 minutes bus. We guarantee your reservation with 30% of the total amount, 30 % is non refundable. Reservations are confirmed paying the 30% by visa, mastercard, bank deposit or cash. All Reservations must be prepaid 30 days in advance during high season. We accept maximun 2 children under 8 years old free of charge, sharing the bed with their parents, any person older than this age is considered an additional guest, therefore a charge of $10 will be applied for each they of your stay at the hotel. If you cancel your reservation 48 hours before your arrival, reimbursement will be made by 70% of the total amount, 30 % at the moment you made the reservation is non refundable. If you cancel during 48hours in advance of your arrival, later or in case of NO-SHOW, the total amount of your reservation will be charged. We accept, Cash, Master Card, Visa & American express. You agree with the Reservation & cancellation policies at the momento you make the reservation through this web site. 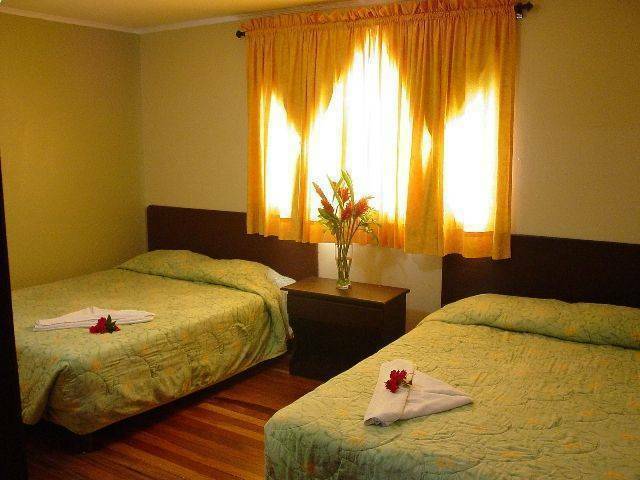 We are located 1 km East from Juan Santamaria International Airport Costa Rica, on the road to Heredia. Our Guest can get a taxi only making a phone call and the taxi. Bus service is every 5 or 10 minutes. Nearest airport: Juan Santamaria Intl Airport. 1 km east.